Use these stunning invitations to invite your guests to the wedding reception on the big day. These Kraft initiations are truly stunning with beautiful gold foiling detail. Space on each invite to write the happy couples names; location, date and time of the reception. Each pack contains 10 wedding reception invitations complete with Kraft envelopes. 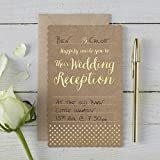 Each invite is 10.5cm W x 17.5cm H.
Send with our Kraft Perfection RSVP cards to ensure your wedding stationary is complete.